Although is was 12 degrees cooler on Sunday than it was on Saturday, it still turned out to be a nearly ideal day for this time of year, with the afternoon high at the Rockford airport of 71 degrees. That compares favorably with the September 30th average of 70 degrees. High pressure ridging across the Stateline from Michigan will give our region a partly cloudy night. There will be some high cloud cover passing overhead associated with a storm system far to the south over Mississippi. Later tonight there may be some patchy fog, mostly in low lying rural areas next to creeks, streams, and rivers, away from cities across north central Illinois. The overnight low will be in the middle 40's with a light easterly wind. On Monday high clouds will continue to stream overhead as the Mississippi low moves to central Tennessee by evening. So, the Stateline can look for sunshine filtered through high clouds on Monday. The wind will be southeast a 5 to 10 mph, and the afternoon high will be a pleasant 72 degrees. On Tuesday, the major low will be over western Kentucky, skies will be partly cloudy with a northeast wind at 10 to 15 mph. The high will be in the low 70's once again. On Tuesday night and Wednesday morning the low will move into Michigan. It will be partly cloudy with a slight chance of showers. You can expect one last 70 degree high on Wednesday afternoon before the cold front arrives on Thursday. The front that willo\ pass southeast across the will be a very strong one. There will be a good chance of showers on Thursday with a high in the upper 60's as the wind switches to the northwest bringing considerably cool air into the Stateline for the rest of the week through next weekend. Highs will only be in the low to mid 50's, and lows will be in the low to middle 30's from Friday through Sunday. There could be some scattered instability showers Friday and Saturday as very cold air aloft moves across the area. Great Way to Wrap up September! The Stateline had a fabulous day to start the last weekend of September. The high on Saturday reached 83 degrees at the Rockford airport, which was 10 degrees above average for the date. Not only were the temperatures very nice, the humidity was low, and the winds were light from the north. It will be clear and seasonal overnight with a low in the middle 40's. Somewhat cooler air will push across the area from the northeast on Sunday. It will still be a very nice day with sunshine, and an afternoon high around 70 degrees. The high pressure ridge will continue it's presence across the area Sunday night and Monday with overnight lows in the 40's and highs in the low 70's. A weak ridge of high pressure will continue through Wednesday. Temperatures are expected to warm into the upper 70's on Wednesday in advance of a strong cold front dropping toward the southeast out of the northern plains. There could be some showers on Thursday with the passage of the front. A sprawling area of Canadian high pressure will follow in behind the front. High temperatures on Friday and Saturday will only be in the low to middle 50's, and low temperatures will be down in the 30's. The latest drought monitor isn't showing much promise for the Stateline. Let's start with Illinois. While the state saw some improvement in the moderate drought department, it was all to our south. A good chunk of the Stateline continues to fall under the extreme drought category. Wisconsin continues to see slightly worsening drought conditions. The southern part of the state continues to suffer from extreme drought conditions. Extreme drought conditions are also starting to spread north. The forecast is looking incredibly dry over the next week, with very slight rain chances on Monday. If this pattern holds up, we'll be looking at the longest timespan without any rain whatsoever this year. Now that it's officially fall, we can say goodbye to what was a very hot and dry summer. You've heard us talk about how the heat and the dryness have ranked compared to previous years, but the Chicago branch of the National Weather Service did something interested in their latest newsletter. They combined the hot and dry conditions and ranked the pair against previous summers. No shock here. While some summers may have been hot with plenty of rain or dry with cooler temperatures, 2012 ranked in the top four for both, making this summer the worst in terms of being both hot and dry. Here's hoping the fall goes a lot smoother than this summer! It's not too often that we see this long of a stretch of beautiful weather across the Stateline, but it's here. But what is giving us such a quiet pattern heading into the weekend? High pressure looks to dig in to our north for the next several days. This does two things. It not only keeps temperatures in a seasonable range for us (upper 60s to low 70s), but also keeps rain chances to our south with a slow moving front. While rain won't be a concern for us, that front will make for a soggy week in southern Illinois and much of the Ohio Valley. Here's a look at the current 7-day forecast and just how nice it will be this week. Enjoy! Frosty & Cold Monday Morning! It was a very frosty start this morning for some as the mercury dipped below freezing across northern Illinois. Overnight lows Monday morning were as cold as 28° near Sterling and Dixon and 31° here in Rockford. With the low temperature dropping below the freezing mark this morning it marks the first September freeze in Rockford since September 29th, 2003 and the earliest freeze in Rockford in 17 years, since September 22nd, 1995. While this wasn't considered a killing freeze (temperature has to drop below 28°) it may have been in Sterling if the low temperature is actually correct. Looking ahead temperatures will warm for the last week of September with highs in the 70s and overnight lows in the 40s. A sprawling chilly Canadian high pressure is centered over Illinois tonight. Skies are clear. The wind is calm. The dew points are in the low 30's. The barometric pressure is high and continuing to rise. So, all things considered, the Stateline will have strong radiational cooling overnight. With that in mind, a FROST ADVISORY has been issued for the entire region overnight until 8 am on Monday morning. The overnight low will be in the middle 30's with a few areas falling into the low 30's. Because of the anticipated frost and near freezing temperatures it would be a good idea to cover and tender plants that you can't bring inside. By the way the record low for Rockford tonight is 28 degrees set in 1976. That record does not appear to be in jeopardy. There will be a very cool start to the day on Monday with patches of frost. The frost will melt by 8 am under bright sunshine. The large chilly high will be over Kentucky by daybreak, and West Virginia by noon. A southwesterly wind will pick up during the day as the gradient increases. By noon the wind will be blowing at 15 to 25 mph it may increase to 20 to 30 mph mid afternoon. A nice warm up will ensue under sunny skies pushing the afternoon temperature close to 70 degrees. It will remain clear on Monday night, and with the southwesterly winds continuing at 10-15 mph, the temperature will hold in the upper 40's for lows. On Tuesday the warm up will continue with the temperature reaching the upper 70's before the next cool front moves into the area during the afternoon. Very little moisture is available for the front to work on, so the front is expected to pass through the Stateline without producing any precipitation. A modest cool down will occur behind the front with highs in the upper 60's and lows in the 40's. Little if any precipitation is expected during the next 7 days, although it does look like down state areas could receive some decent rainfall amounts. A large cold Canadian high is sitting over Fargo, North Dakota early tonight. Although Saturday was officially the first day of fall, it does seem like it's a little to early to have frost and freezing temperatures across a large part of the northern plains into the upper mid west. A FROST ADVISORY has been issued for the following counties in south central Wisconsin and north central Illinois: Rock, Winnebago, Boone, DeKalb, Ogle, and Lee from 3 am to 8 am Sunday morning. A FREEZE WARNING has been issued for the following counties in southern Wisconsin and northwestern Illinois: Green, Stephenson, Jo Daviess, and Carroll from 3 am until 8 am on Sunday morning. Overnight temperatures are expected to drop into the low 30's with widespread frost. The record low for September 23rd in Rockford is 29 degrees set in 1974. That record does not appear to be in jeopardy. The average date for the first 32 degree reading in the fall for Rockford is October 7th. So, if the area reaches 32 degrees overnight, the growing season would come to an end about 2 weeks ahead of schedule. Frost sensitive plants are threatened tonight, and it is advised that you either bring them indoors, or cover them to provide protection from the frost and freezing temperatures. After a frosty start on Sunday morning, the sun will rapidly melt any frost that forms, and it should be gone by 8 am or shortly thereafter. Sunday will be a sunny day, but it will be chilly with a northwest wind at 10 to 15 mph, and an afternoon high reaching around 59 degrees. The average high this time of year is 73 degrees. The sprawling Canadian high will move to Illinois by Sunday evening providing another clear and cold night. There will be a good chance that frost will form across the Stateline again on Sunday night with a low in the middle 30's. On Monday the high will shift off to the east allowing winds to become southerly. A warm up will commence, and the afternoon temperature should top out near 70 degrees. Monday night will not be a cold with a low in the upper 40's under mostly clear skies. On Tuesday it should warm up into the middle 70's in advance of the next cold front dropping south out of Wisconsin. The front will move across the area early on Tuesday night. There is very little moisture available for the front to work on, so it should move through as a dry front. The air behind the front is not as cold as the last one, so no large drops in temperature are expected on Wednesday, and high temperatures should still reach the upper 60's. A Freeze Watch has been issued for Jo Daviess, Carroll, Whiteside and Stephenson counties in northwest Illinois along with Green county in Wisconsin. These will go into effect Saturday night and last through Sunday morning. 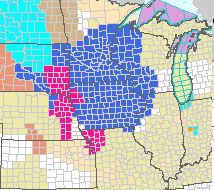 Freeze Watches extend through the Midwest and I wouldn't be surprised to see an extension in the watch to cover the remainder of Wisconsin as well as northern Illinois by tomorrow. Temperatures Saturday night will drop into the low 30s with below freezing conditions possible closer to the Mississippi River. Weekend Forecast: Welcome to Fall! Fall officially begins Saturday morning at 9:49 am and boy-oh-boy are temperatures going to reflect that this weekend. A secondary cold front will move through early Saturday morning ushering in a much more cooler and drier air mass. As this front comes through scattered showers will remain possible through the first half of Saturday before cloud cover breaks up and skies begin to clear during the evening. Temperatures will remain cool with a breezy northwest wind. Highs will reach the upper 50s to near 60°. With the clearing skies likely overnight temperatures will tumble into the 30s by sunrise Sunday. Temperatures a few thousand feet above the surface will drop below freezing and that cold air will translate down to the surface. Frost will also be likely early Sunday morning before high pressure moves during the afternoon. A few clouds will build by the afternoon Sunday with temperatures near 60°. A return of the 70s will be in the works for next week. It was a frosty start this morning for some. Temperatures dipped into the mid and upper 30s with a few low 40s just to the northwest. Winds now have greatly increased from the southwest with gusts nearing 35-40 mph and will continue through the afternoon. With the gusty winds and low relative humidity there still remains a high fire danger as Red Flag Warnings have been issued for Winnebago, Boone, Ogle, Lee, McHenry and DeKalb counties. Temperatures today will rise into the low 70s ahead of a cold front that will move through this evening bringing with it the threat for showers and thunderstorms by this evening. This is a timelapse video of the Arctic sea ice. On August 26th Arctic sea ice dipped below the record smallest daily extent which was previously set on September 18th, 2007. This also marks the first time that there has been less than four million square kilometers of sea ice since satellite observations began in 1979. The National Snow and Ice Data Center will confirm the final minimum ice extent data and area once the melt stabilizes, usually around mid-September. A Frost Advisory has been issued for Green, Rock and Walworth counties in southern Wisconsin through 6am this morning. Frost has developed across Wisconsin as temperatures have fallen into the middle 30s in many locations. Clouds will increase by daybreak along with an increase in southerly winds helping to warm temperatures early this morning. Until then, it's a very chilly start this morning! Tonight will be our first shot at seeing some patchy just ahead of the official start of the fall season, but it shouldn't come as a total surprise if you know anything about the climate of the Stateline. The first freeze of the season is when the temperature hits 32 degrees. As you can see on the map to the right, that usually happens during the first part of October for most of northern Illinois. While this cool down might be happening earlier than normal, at least we're not in record territory. The record for Rockford's earliest first freeze of the fall season is September 13th, 1975. A very cold and dry air mass will be upon us tonight as high pressure originating from Canada moves through the mid-Mississippi River Valley. There are a few things I want to discuss in this post with the first concerning this afternoon. Sunny skies will be found this morning but by mid to late morning you'll begin to notice those puffy clouds building in the sky. These are what we call fair weather cumulus clouds. As the warm sun heats the ground the air particles at the surface will begin to rise. As they rise they'll enter into a fairly cold atmosphere only a few thousand feet above. Once that rising air cools enough clouds begin to form. Sometimes there can be a threat for sprinkles or showers but I feel with the very dry atmosphere in place it will be hard to get anything to fall, let along reach the surface. Temperatures this morning near the core of the cold air fell into the low 30s as Frost Advisories and Freeze Warnings were issued for parts of the upper Midwest and northern Great Lakes. We're not expecting temperatures to drop that significantly but it is going to get cold tonight. Under clear skies and light winds meteorologists will look at the dew point temperature to get an idea of just what the overnight low could 'potentially' drop to. With dew points upstream in the 30s it's likely that temperatures tonight across northern Illinois and southern Wisconsin will at least drop into the upper 30s, if not mid 30s. The big question tonight will be if there could be any frost development by Wednesday morning. It's possible that there will be patchy frost but I feel widespread frost may be just a little hard to come by just yet. First, the center of the high will be just to our south and then quickly slide southeast by Wednesday morning. This means that our winds will likely go calm (or near calm) between about 8pm/9pm and roughly 2am before switching around to the southwest. It's during this time when temperatures will likely nose dive into the 30s and patchy frost may form. If cloud cover moves in or the winds shift around to the southwest sooner the frost potential will decrease. Another thing to keep in mind is that current soil temperatures are still in the low 60s. Click here for a list of the 4 inch and 8 inch soil temperatures. Our average first frost usually occurs in the first week of October, so we're not that far away. While Tuesday night will be a cold night it's not going to be the only cold one this week. Another shot of cold air looks to arrive this weekend with Saturday night's low potentially dropping into the 30s once again. How appropriate considering it will be the first night of fall. Either way you may want to think about covering up the plants or even spraying a little water on them to keep the heat in overnight. Hmmm - I wonder where the cold front is? It's actually about ready to cross over the Mississippi River as of 11:30 am. The colder air is lagging behind the front and once it passes by late afternoon expect temperatures to fall by this evening. With the few breaks in the cloud cover this morning the atmosphere is beginning to destabilize just a little bit as indicated by the cumulus clouds building in the skies. As the front moves through rain, as well as a few thunderstorms, remain likely with a start time roughly around 3pm or 4pm. So far the activity that has been entering into northeast Iowa has just been rain with thunderstorms closer to Omaha, NE. If there were to be any thunderstorms this afternoon the hail threat would be the greatest due to the colder air aloft. Rain will end by this evening with the next chance arriving Wednesday night. After a gorgeous weekend a big pattern change will make the last week of summer feel anything but that. A strong cold front stretching from northern Wisconsin southwest through Rochester, MN to Sioux City, IA this morning will quickly race southeast this afternoon. Cloud cover has been increasing ahead of the front and is expected to continue into the afternoon. Showers, with a few embedded thunderstorms, have been developing just behind the front as a very strong jetstream helps to carve out a trough of low pressure in the northern Plains. The rain will likely maintain itself through the afternoon and evening due to the strong jetstream despite the lack of sunshine we're currently experiencing. Behind the front very cold air will filter into the Plains and Midwest beginning tonight with temperatures in Minnesota and northern Wisconsin expected to plummet into the upper 20s/low 30s. That cold air will be in our neck of the woods Tuesday night as a surface high pressure system moves in overhead. The center of the high is expected to be almost overhead once the sun sets Tuesday and this will likely set the stage for temperatures to nose dive into the upper 30s before an increase in cloud cover arrives by daybreak Wednesday. Right now I'm forecasting a low temperature of 37° which is just three short degrees away from the record low of 34° set back in 1929. It's also possible that patchy frost could develop Tuesday night with the greatest potential to the north where temperatures will likely be the coldest. On average, the first frost usually occurs within the first week of October usually around the 10th (give or take a few days). Is it certain that there will be frost, no. But it's something to keep in mind for Tuesday. The afternoon on Tuesday will also be cold with the high temperature only expected to be right around 60°. Highs will remain cool this week as a series of cold fronts move through; the first today, the second on Wednesday and the third Thursday night. As each front passes it will continue to pull down a cool air mass just in time for the weekend. The last weekend of summer proved to be a fabulous one. There was lots of sunshine, and temperatures reached the low 80's on Saturday and the upper 70's on Sunday. A strong cold front is approaching from the northwest tonight, and will pass through the Stateline around noon on Monday ushering much colder air into the mid west. In advance of the cold front tonight, clear skies will slowly become partly cloudy. It will not be a cool as the last two night's with a low around 55 degrees. Monday will be mostly cloudy, and there could be some scattered showers in the morning. There is no gulf air available for the front to work on, so rain amounts are expected to be relatively light... around 0.25" or so. There could be an isolated thunderstorm or two with the passage of the front because of unstable conditions with very cold air aloft with the passage of the front. High temperatures around 73 degrees will occur around noon, the wind will switch to the northwest at 10-20 mph, and temperatures will fall during the afternoon as colder air follows in behind the front. Some scattered light showers could linger until around midnight, skies will become partly cloudy, and it will be colder with a low in the low 40's. A large area of Canadian high pressure will be centered near Sioux City, Iowa by 6 am on Tuesday. A brisk northwesterly wind will hold temperatures in the 50's for most of the day under sunny skies. The high temperature may reach 60 degrees in Rockford on Tuesday afternoon. It will be clear and cold on Tuesday night as the high pressure moves to near Quincy, Illinois by 6 am Wednesday morning. With the core of the cold high very nearby, clear skies, and light winds, there will be maximum radiational cooling during the night dropping temperatures across the Stateline into the middle 30's, which is likely to cause some early season patchy frost. Any frost that does occur will likely be in low lying rural areas, but may edge into some small cities. Full sunshine during the morning will cause a nice rise in temperatures, and by afternoon it may be as mild as 68 degrees in the Rockford area. There will be an increase in clouds by late in the afternoon as the next system dropping down in the fast northwesterly upper air flow approaches the Stateline. Scattered showers may develop on Wednesday night in advance of the front. The low will be in the low 50's. The next cool front will sweep across the area early on Thursday morning, and there could be some scattered light showers on Thursday. Another front will move into the area early on Friday with a good chance of more light rain showers. Temperatures will drop to the mid 40's for overnight lows next weekend, and rise to the middle 60's. Below average temperatures area expected to continue for the rest of September. High pressure was the weather maker over all of the mid west today from a center over Illinois. There was full sunshine, low humidity, light winds, and very comfortable temperatures. The high temperature in Rockford reached 81 degrees. It will remain clear overnight with a low around 50 degrees. The center of the high will move east to West Virginia by 6 am on Sunday, but it will ridge back into Illinois and continue to dominate area weather. So, Sunday will be sunny again with a southwesterly wind picking up to 10-15 mph in the afternoon. The temperature will reach the low 80's. with blue skies and low humidity. Sunday is my pick day of the week. It may be a while until we see 80 degree temperatures again with a pattern change taking place this coming week that will sweep a strong cold front across the Stateline during the mid day hours on Monday. There is not a lot of moisture for this next system to work with, but right now it looks like there will be enough to make showers and possibly some thunderstorms. Rainfall amounts are expected to be fairly light (around 0.25"). So this next system will not do much to put a dent in the extreme drought across northern Illinois. Temperatures will top out in the low 70's before frontal passage on Monday. It will be breezy and cooler with falling temperatures on Monday afternoon. A couple of showers could linger into Monday evening, followed by gradual clearing. It will be much cooler with a low in the low 40's. It will be breezy with a brisk northwesterly wind on Tuesday. Temperatures will not recover much , and may have a hard time reaching beyond the upper 50's for afternoon highs. With the ridge of Canadian high pressure overhead on Tuesday night, skies will be clear, and winds will be light, allowing for strong radiational cooling dropping temperatures to the coolest levels so far this season. The overnight low into early Wednesday morning will be in the upper 30's with the possibility of some patchy frost in scattered low lying areas of south central Wisconsin just to the north of Rockford. Canadian high pressure was responsible for the sunshine, low humidity, blue skies, light winds, and comfortable temperatures across the Stateline on Friday. The high was 75 degrees in Rockford, and that was just 1 degree below average. The sprawling high will edge slowly eastward across the area overnight, and it will be centered just to our east on Saturday. It will provide the Stateline with another sunny day on Saturday, and yet another on Sunday. The afternoon temperatures will reach the upper 70's to around 80 degrees both days. It will be comfortable with low humidity, but by Sunday afternoon the wind will pick up from the southwest at 10-15 mph. A new cold front will approach the area on Monday morning. This front is a strong one with significant cooling following in behind it. There will be a good chance of showers associated with the frontal passage, and maybe even an isolated thunderstorm. It will be cooler with the high temperature around 69 degrees occurring in the morning, and temperatures falling into the upper 50's or low 60's by late afternoon. There could still be some scattered showers in the evening. It will be breezy and cooler overnight with an early morning low around 43 degrees. Canadian high pressure will follow in behind the front dropping temperatures to around 40 degrees on Tuesday night. There will be a relatively fast northwest flow across the northern plains into the upper mid west, and the next cold front will already drop across northwestern Minnesota across southern South Dakota by 6 am on Wednesday. Our area will see a bit of a warm up with the afternoon highs reaching close to 70 degrees. There will be a slight chance of showers late in the day, and a better chance on Wednesday night as the front pushes through the Stateline. Temperatures will remain cool through Friday with highs in the 60's and lows 45 to 50 degrees. We're beginning to enter into the season where large temperature swings will become more common; chilly mornings but warm afternoons. As September begins to come to a close the likely hood of us reaching another 90 degree continues to fade, along with the frequency of 80 degree weather. We lose 10° from the beginning of the month to the end of the month with the average high and it appears as if the cool trend will continue into next week. The weekend looks absolutely gorgeous with comfortable afternoons as high temperatures reach the middle and upper 70s. Overnight lows will be chilly making this weekend the perfect 'cuddle up' weekend. By next week a strong cold front will sweep down from Canada Monday night bringing with it the threat for rain but also much cooler weather. Temperatures next week look to only reach the middle 60s on Tuesday and with the jetstream pattern remaining in place the cooler weather may even continue for the end of the month. It's only the second week of the NFL season, but there couldn't be a bigger game than the Bears and Packers matchup tonight. Fortunately, the forecast should cooperate for tonight's game. Look for clearing skies through the game (more importantly, no rain!) and chilly temps. Temps around kickoff will be in the upper 50s, cooling into the upper 40s by the end of the game. A light, chilly rain will continue to fall Thursday behind a strong cold front that passed early in the morning. Behind the rain cool, dry air will filter in tonight as high pressure moves into the Midwest and with clearing skies this will make for a very cold start Friday morning. Lows tonight will drop into the middle 40s! Looks like the 40s will remain through the weekend with possibly another cold snap by the middle of next week. With my farming background I found this article very interesting from the Iowa State University Extension and Outreach. Due to the ongoing drought in Iowa there is an increased risk of harvest fires in fields. Even though some improvement has been made in Illinois I would also guess this may be a growing concern for Illinois & Wisconsin farmers as well. Warm, dry winds rapidly dry plant materials. With potential for an earlier maturing crop and resulting early harvest, air temperatures will likely be warmer than during typical October conditions. Farmers in northwest Iowa experienced a greater than average number of harvest fires during 2011. A recent study by South Dakota State University ag engineers found an average of nearly seven combine fires per county in nine northwest Iowa counties. Although air temperatures were warm and relative humidity was low during much of early harvest, most fires occurred on days with wind speeds averaging 15 mi/h and occasional gusts of 25 to 30 mi/h. This suggests that not only should combine operators be careful when field conditions are dry and air conditions are warm, they should be extra vigilant during windy periods. A combine or field fire stops harvest quickly. During harvest periods with increased potential, fires cause millions of dollars in property damage in Iowa, including loss of machinery, crops and time. •Keep the machine clean, particularly around the engine and engine compartment. Use a high pressure washer or compressed air to remove caked-on oil, grease and crop residue. •Check coolant and oil levels daily. •Check the pressurized oil supply line to the turbocharger for wear areas that rub and may start an oil leak. •Frequently blow leaves, chaff and plant material from the engine area with compressed air or a portable leaf blower. Remove plant materials wrapped on or near bearings, belts or other moving parts. •Examine exhaust or hot bearing surfaces. Repair leaking fuel or oil hoses, fittings or metal lines immediately. •Inspect and clean ledges or recessed areas near fuel tanks and lines. In case of fire, carry a cell phone to call the fire department. Two ABC-type fire extinguishers are recommended: a smaller 10-pound unit in the cab and a larger 20-pound extinguisher at ground level on the combine. Invert and shake the extinguishers once or twice a season to ensure machine vibrations don’t compact the powder inside. A shovel to throw dirt can also help. Fires may start from plant materials that have smoldered unnoticed for 15 to 30 minutes or more. The ignition source for field fires may have been the earlier passing of a truck, tractor or combine. Flames aren’t apparent until additional oxygen is supplied, perhaps by a gust of wind. Harvest crews may want to discuss a plan for emergency tillage of a fire break should that option become advisable. Keep in mind that personal safety is more important than property loss. With current prospects for an early, dry harvest, fire prevention measures will be more important than usual. If you know anything about radars, it won't surprise you that they pick up more than just rain. 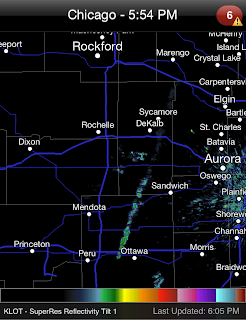 That was the case this afternoon when a 100-acre brush fire broke out west of Ottawa, Illinois. 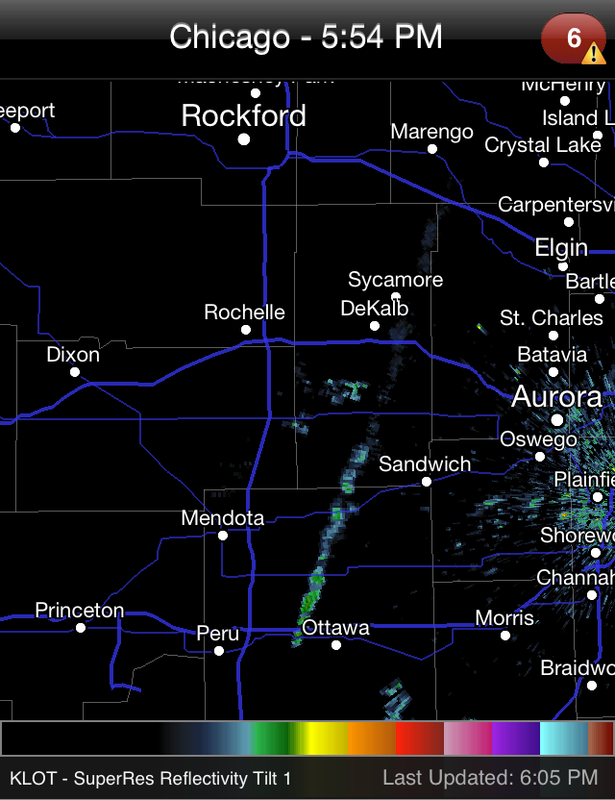 This radar image shows the plume of smoke coming off of the fire. The smoke caused visibility issues along several major roadways, including I-80 and I-88. The radar image from around 6pm shows the smoke starting to lessen a little bit, which is a good sign that the fire is weakening. Gusty winds, warm temperatures, low humidity and an ongoing drought have lead to Red Flag Warnings being issued for the Plains and Midwest this afternoon. Temperatures today will climb into the middle and upper 80s for many across the heartland ahead of a cold front that will move through the Midwest today and tomorrow and into the Great Lakes by Thursday. Temperatures closer to home will warm both today and tomorrow but with low humidity it should still feel comfortable. After reaching near 90° Wednesday afternoon temperatures will tumble Thursday and Friday behind the cold front into the 70s and possibly upper 60s in a few locations. Depending on how long the cloud cover and rain continue it could be a chilly start to the weekend. The transition from summer to fall is a lot like a roller coaster and we will see a great example of that this week. The next couple of days will be a taste of summer. Temps will warm up into the upper 80s ahead of a cold front on Tuesday. Breezy winds from the southwest will aid in the warmup. Wednesday will be more of the same. Temps might be a degree or two warmer, with some areas even hitting 90 as our cold front still sits off to the northwest. Rain is likely on Thursday, which will help knock highs back into the 70s. Some leftover rain is possible early Friday as highs continue to dip into the 60s. The latest rainfall forecast is showing a good deal of rain possible (1" in some spots) for the end of the work week. Temperatures this past weekend were more typical of fall with the high reaching 74° on Saturday and 73° on Sunday. Cool, Canadian air rushed southward causing temperatures to dip below freezing in parts of North Dakota early Sunday morning which prompted Frost Advisories. The low this morning reached 48° at the Chicago Rockford Int'l Airport as the chill remains in the air for one more day. Temperature extremes are very common for this time of year as the seasons begin to change. Our temperature swings come Tuesday and Wednesday as the mercury is expected to climb into the middle and upper 80s both days. The ridge of high pressure in the west will shift east over the Great Plains as high pressure moves into the Mid-Atlantic. Winds will turn southerly this afternoon and pick up Tuesday allowing temperatures to quickly rise into the middle 80s during the day. Since humidity will be lacking and the soil is still relatively dry from the ongoing drought in northern Illinois and southern Wisconsin it's possible temperatures may reach near 90° Wednesday afternoon. Don't get too excited, however, as another strong front comes through Thursday bringing temperatures back below average by the weekend. Canadian High pressure over Wisconsin will drop southward into Illinois overnight. Skies will be clear, wind will be calm, and the temperature will drop into the upper 40's by daybreak. There could be some patchy fog in low lying areas later tonight. The high pressure will move across northern Illinois into northern Indiana by daybreak on Monday. The high will be the dominate force in Stateline area weather for the next few days. It will be sunny on Monday, but with the center shifting off to the east, the wind will pick up from the southwest at 10 to 15 mph on Monday afternoon. The high will be around 76 degrees on Monday with low humidity.... another fabulous day! It will still be clear on Monday night, but it will not be as cold with a low around 53 degrees. On Tuesday, with southwesterly breezes continuing under a sunny sky, the warming trend will continue with a high around 84 degrees. On Wednesday northern Illinois will still be on the periphery of the departing along the east coast. Skies will be sunny again, and with a persistent southwesterly wind, the afternoon temperatures will be pushed toward 90 degrees once again. It probably will not reach 90, and my forecast is for 88 degrees, but 90 degrees cannot be ruled out with this pattern, and sunshine, and dry soils from the ongoing extreme drought across most of northern Illinois. A cool front will move from northwestern Wisconsin and northwestern Iowa on Wednesday morning into the Stateline by 6 am on Thursday. Scattered showers and thunderstorms will develop across northern Illinois and southern Wisconsin on Wednesday night. The front will slow down as a disturbance forms on the front just to our south on Thursday night contining chances of showers through Thursday night into Friday. It will be cooler behind the front with afternoon temperatures dropping into the low 70's on Friday, Saturday, and Sunday. A strong disturbance associated with a fresh shot of Canadian air is centered over eastern Wisconsin early tonight. 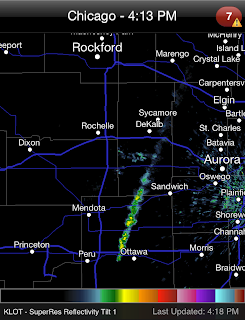 It caused some showers to pass across north central Illinois earlier this evening. 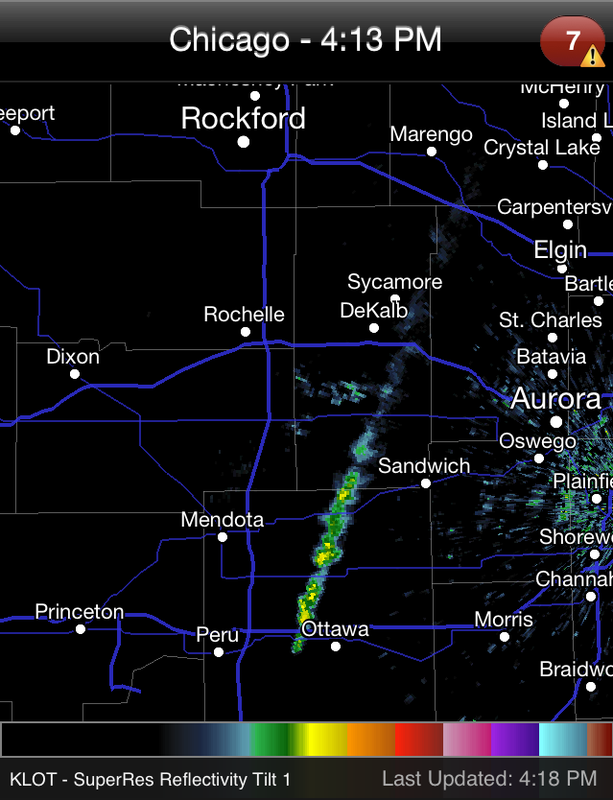 Those showers have since move eastward out of the area, and are over southern Lake Michigan at 11:45 pm Saturday night. The clouds will break up, and it will become mostly clear overnight. It will be breezy with a northwest wind at 10 to 15 mph. The low tonight will be around 50 degrees. After a cool start on Sunday, temperatures will reach into the comfort zone in the afternoon. The high will be in the low 70's with a brisk northwesterly breeze. There may be a few cumulus clouds, but it will be a mostly sunny day with blue skies and low humidity. The Canadian high will move to Wisconsin early on Sunday night. It will be clear and cool overnight with light winds. The temperature will drop into the upper 40's. The center of the high will move to southwestern lower Michigan by early on Monday morning. With the high still in control of area weather, it will be sunny, and the high will be in the middle 70's. On Tuesday the high will move to Pennsylvania, but will still be in control of Stateline weather. A southwest wind will develop across the area, and temperatures will rise into the low 80's under sunny skies. It will still be sunny on Wednesday, but temperatures will continue to warm under a southwesterly wind flow. It will be warm with a high in the middle 80's. In fact, that forecast may not be warm enough because the dry soils in the area from the ongoing drought will warm up fairly easily, so it is possible that temperatures could be close to 90 degrees again on Wednesday. A front will move into the area from the northwest on Wednesday night. There is a slight chance of showers as the front moves into the area overnight. It will be mild with a low in the low 60's. On Thursday the front will be slowly edging through the area, temperatures will be cooler, and there could be some showers and thunderstorms Thursday and Thursday night. Cooler air will follow in behind the front. High temperatures will drop back into the 70's for the end of the week into Saturday. Cool unstable air aloft could fire off some scattered light rain showers Friday and Saturday. If you like fall weather, this weekend is going to be perfect for you, but as we warm back into the 80s next week, we'll continue our run into the record books as far as the heat is concerned. As of Thursday, Rockford has seen 99 days with highs at or above 80 degrees. We're on pace to break into the top 10 by the time the heat comes to an end later in the coming months. Check out the full list below. The other record we're keeping an eye on is the average temperature in Rockford this year. When you average all of our highs and lows together, you end up with a temperature of just over 57 degrees. It may not seem like much, but it’s over 2.5 degrees warmer than the all-time record. In fact, when you look at the top 5, this record could get destroyed unless things start to cool off soon. So we do actually have a degree! This was an article in the NYTimes that I thought was pretty interesting. It may be long but it's an interesting read. Weather also has two additional properties that make forecasting even more difficult. First, weather is nonlinear, meaning that it abides by exponential rather than by arithmetic relationships. Second, it’s dynamic — its behavior at one point in time influences its behavior in the future. Imagine that we’re supposed to be taking the sum of 5 and 5, but we keyed in the second number as 6 by mistake. That will give us an answer of 11 instead of 10. We’ll be wrong, but not by much; addition, as a linear operation, is pretty forgiving. Exponential operations, however, extract a lot more punishment when there are inaccuracies in our data. If instead of taking 55 — which should be 3,215 — we instead take 56, we wind up with an answer of 15,625. This problem quickly compounds when the process is dynamic, because outputs at one stage of the process become our inputs in the next. 8:30am Update: Rain is now winding down with a bit of clearing occuring across northern Illinois. A little more rain is expected to develop by this afternoon as low pressure tracks through central Illinois. Light to moderate rain will continue across southern Wisconsin and northern Illinois with a few embedded thunderstorms, mainly south. Rain will continue through 10am with a brief break until the afternoon. Low pressure currently in southern Iowa will track east across central Illinois. As it does winds within the jetstream will strengthen allowing the low to intensify as it moves south of Chicago. Heavier rainfall may develop from southeast Wisconsin into north-central Illinois mid-afternoon and early evening. Rainfall should begin to move out from west to east late this evening. 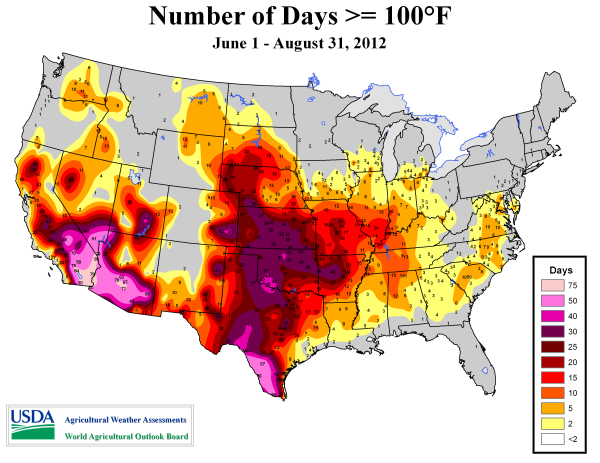 Number of 100 degree or higher days this summer in the U.S. Here is a map highlighting the number of days this summer (June 1st - August 31st) that experienced 100 degree weather or higher. There were six days this summer where the mercury climbed to 100° or more in Rockford: one day in June and five in July. 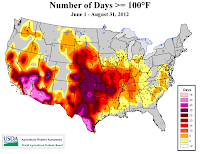 Look how many days of heat were felt in the desert southwest and through the Plains! Amazing! High pressure moving in this afternoon will leave skies mostly sunny across a good chunk of the Midwest today. Changes are on the way, however, as the jetstream which is currently in Canada shifts south by this weekend. Low pressure developing in the Plains Thursday morning will gain a little more strength as it moves into Nebraska late this afternoon. As it does warmer air from the south will lift north through Missouri and Iowa tonight likely causing a few elevated thunderstorms to form aided by the low level jet as well as a strengthening jetstream. While storms are not expected across the immediate area tonight there may be a few crossing over the Mississippi River into northwest Illinois by early Friday morning. With elevated thunderstorms hail becomes a primary threat. Once this system passes Friday night highs this weekend will feel a lot more like autumn with temperatures in the low to mid 70s. 8:26pm Update: Severe storm chances (plus any rain, for that matter) are done for the night. Cooler temps move in starting tomorrow. The current time frame for any storm development will be between now and 8pm (just after sunset). At that point, if we haven't seen any storms, we probably won't. If storms do develop, hail and wind will be the main concerns, with just an isolated chance of a tornado. 4:15pm Update: Areas of northern Illinois are currently being monitored for a possible severe thunderstorm watch. There is roughly a 40% chance one may be issued within the next couple of hours. Despite storms Wednesday morning the atmosphere has become a little more unstable with the sunshine. If storms do form conditions would become favorable for hail and wind. Storms would generally remain isolated and there may be a few that try to get going within the next hour or two. Skies have cleared significantly behind the thunderstorms from this morning and this will continue to allow the atmosphere to destabilize ahead of a cold front currently in central Iowa. The thunderstorms from this morning have left a few outflow boundaries across Illinois and those could potentially interact with the approaching cold front later this afternoon and evening. Strong surface heating combined with moisture returning into northern Illinois will increase atmospheric instability by 5pm and likely allow storm development in Wisconsin and Illinois. Storms capable of large hail, damaging winds and isolated tornadoes remain possible through the evening. Conditions will be monitored to see where exactly clouds begin to build this afternoon because that will give us a better idea of where storms will initially develop. 5:50am Update: Non-severe thunderstorms will continue to move through Wisconsin and Illinois this morning. Severe weather will not be a threat but there could be a few heavier downpours which may cause some ponding on roadways early this morning. A line of thunderstorms will continue to move east/southeast early this morning entering into western Jo Daviess county around 3:30am. As of this update the only severe thunderstorm warning is for Lafayette county in southwest Wisconsin. This storm will continue to move east around 15 to 20 mph and begin to affect western sections of Green county around 4am. The storms that moved through late Tuesday evening have decreased the instability across the immediate area but some of the storms will still be capable of producing pea to quarter sized hail along with wind gusts greater than 50 mph. There is also a noticeable gust front ahead of the main line of storms and this is just beginning to cross the Mississippi River in southwest Jo Daviess county and portions of northwest Carroll county. Winds may pick up before the main line of storms moves through in those areas...generally southwest of Rockford.